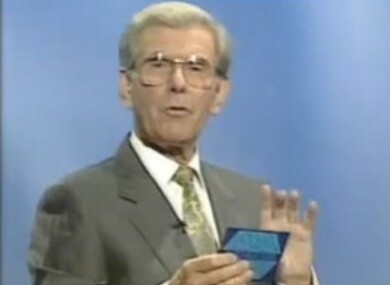 Veteran quiz show presenter Bob Holness died in his sleep today at the age of 83. In a career that spanned almost 60 years, Holness had an accomplished career as a theatre actor and a radio broadcaster in the UK. However he is best known as the host of Blockbusters, the word game quiz which he hosted for 11 years. The ITV show, in which student contestants answered questions from the iconic hexagonal board, was a celebration of the cerebral as contestants battled it out to make it to the ‘gold run’ at the end of the show. 1. If you ever watched Blockbusters then you know about The Dance. Ah, The Dance. The so-called “hand jive” was apparently started by a contestant who was bored waiting for his turn on the show and was one of the most well known elements of the show. Do you remember how it goes? Email “RIP Bob Holness: Our top 5 favourite moments from Blockbusters”. Feedback on “RIP Bob Holness: Our top 5 favourite moments from Blockbusters”.